Are you planning your podcast and wondering if it needs it’s own website? Or are you working with a podcast producer (like me 🙂 ) and your podcast website is next up for discussion? 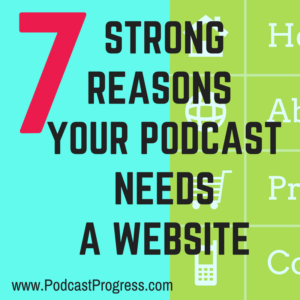 Here are 7 strong reasons why I recommend that you DO have a website for your podcast. Firstly, let’s be clear. I am absolutely NOT talking about hosting your podcast audio files on your website web server. DO NOT DO IT. And of course if you already have a great website, which is totally relevant to your podcast, then you don’t need a separate website, just add your podcast ‘stuff’ as a new menu option, and set up a new subdomain perhaps. But the general idea is that your podcast has it’s own ‘home’ on the internet that is not tied in with any other platform or service. You have independence which is what you need as you can develop business opportunities out of your podcast. It’s under your control. You do what you want. No-one can take it away. Having your own website for your podcast enables you to build up a great catalogue of resources and related information relevant to your podcast listeners. Listeners can find out more about you and find out more about other opportunities to access your products & services. They can’t do that on iTunes or anywhere else for that matter. 2. It’s An Easy Way For Anyone To Enjoy Your Podcast Episodes. Not everyone is an iTunes user! As time passes there are more and more ways & places for listeners to listen to podcasts, and they get easier and easier. Many people have a smart phone now that maybe didn’t have access to a computer previously, so the potential audience base for podcasts keeps growing due to device features and easier ways to listen. However, often the easiest way for people to find your podcast and listen to your episodes is through your podcast website. Your podcast website should be specifically designed to feature your episodes and make it easy to hit play. It keeps the whole podcast alive, and there is not such a focus on only the current or very recent episodes. It provides a great archive of your content. If you choose a self-hosted WordPress website as your podcast hub then there are some excellent ‘podcast’ themes which make a super job of presenting your current and previous episodes in a nice, clear, easy to use, format. People search for problems & solutions, information & entertainment using search engines. You know this. You are already using the internet to power your business. So it works for podcasts too! Just like a blog, each episode of your podcast brings new opportunities for people to find you. You have titles, descriptions, show notes, summaries, images and social sharing opportunities. All created by you (or me or your team), and all being added to the index of everything in the universe that is the internet. All providing more opportunities to ‘get found’. No point in going to the effort of creating a podcast and no-one can find it. Remember podcasting is a very social experience, and people like it because they can build up that feeling of friendship and comfort with you. Each episode is like a blog post, so each episode is an opportunity for listeners to comment and interact with you. Yes, they can also do that on various social media platforms but it’s another sign to the search engines that your podcast is alive and kicking and that people like it when they find it. It gives you an opportunity to learn more about why people like listening and to engage with people who like it enough to bother to comment. You can add contact forms where listeners can send in questions – this provides another easy way for generating content ideas. Feature people who do this – give them a link back to their website. You could also provide an audio feedback feature where people can leave an audio message or question. It can be quicker and easier than typing – especially when on a smartphone. There is a free voicemail widget by SpeakPipe which I know several podcast hosts use. This will depend upon your reasons for podcasting in the first place, but most podcasters are using their podcast as some sort of business growth opportunity. So you need to be growing your email list. You can’t easily do this anywhere else apart from on your own podcast website. Create some kind of interesting offer that listeners can sign up and receive, that is helpful for them. You can then also email your list with updates, newsletters, new episodes, and any ‘spin off’ activities created from your podcast such as a book or training course or event – whatever it is. Your email list is a powerful business asset – your podcast website can help grow it. Getting higher rankings in iTunes, so people find your podcast more easily in there, is related to the amount of reviews and subscribes that your podcast gets. But not everyone knows what to do. So it’s a good idea on your website to have a little post or video to show people what to do and help them understand why it would be nice if they showed support for the podcast and reflect the value and interest they gain from listening. Encouraging listeners to Subscribe & Review in iTunes can be a repeated, prominent call to action on your website. And talking of call to actions, how often do you hear that people will only do one thing, so you need to make a very clear call to action. But when it comes to your podcast there will be plenty of things you would love your listeners to do, so it’s VERY tempting to bombard them at the end of an episode with loads of options. Research proves time and again that if you give people loads of choices at a call to action they get confused or indecisive and so don’t do anything. Annoying but true! So if you structure your podcast website so that it’s easy for people to look at everything else you do and offer, including asking for reviews and subscribes, then you can make ONE clear call to action at the end of your podcast episodes – GO TO YOUR WEBSITE – and let your website design take care of the other actions you want them to do. A clear and simple, easily repeated and understood, podcast website URL is important for this of course because please don’t forget that listeners will very often be listening on a mobile device, whilst doing something else and won’t be able to grab a pen and start writing something down. But isn’t this much easier? One call to action to your website where thre are plenty of opportunities to do everything else. And personally I think it sounds a lot less desperate too! You don’t NEED a podcast website but these 7 reasons show WHY you should really WANT a podcast website. If you don’t have your own website for your podcast, you are missing out on many opportunities for people to actually find you and listen to you. DANGER AHEAD: They will find your competitors instead….. If you are thinking of launching a podcast and want someone to bounce ideas off and get clarity on podcasting. Or you already have a podcast but want to improve it. Please contact me and arrange a no-strings discovery call where I can answer your questions, and make podcasting clear and simple for you.